15% OFF ANY CLASS OR CLASS PACKAGE AS OUR THANK YOU! We know these are the deals you've been waiting for. Check out our website now for sneak peek of our Black Friday & Cyber Monday deals. COME JAM IN YOUR JAMMIES, AND GIVE BACK! 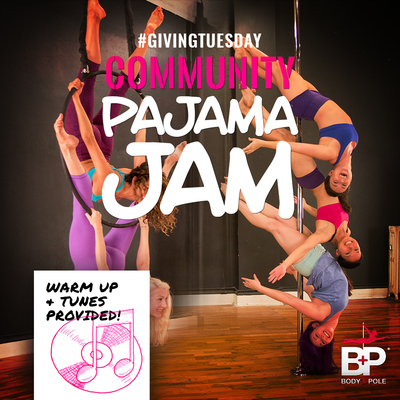 Rock your most comfy jammies, while jamming out on your favorite apparatus, all while raising money for Giving Tuesday. 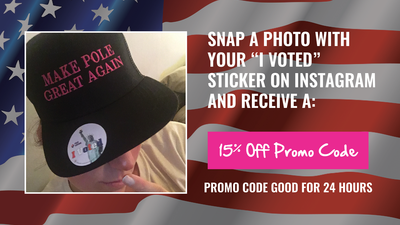 All donations will be matched by Body & Pole! Learn more about the National Women's Law Center here. NOW ON THE SCHEDULE THREE TIMES A WEEK! This content heavy class will keep you dancing from start to finish. Come learn fun and fierce flows designed to exaggerate and emphasize your platform heel! (Heels are not required, however, any bare-footed students are responsible for their own foot safety.) Students must be at least a confident level 1 pole student to attend. We are really excited to offer these limited-run classes throughout the end of 2018 with a fusion of drops, tumbles, dynamics, and holiday-inspired specialty classes for festive fun! Enjoy new classes like Swinging into Fall (Swinging Pole), Fall Fluidity: Dance Trapeze, Harvest Moon Hair Flips, and much more! Check it out under the "B&P PLUS" tab. Our work-study of the month for October was Donna! Hard working, and a creative force, Donna is highly involved in our community (she just choreographed in our Halloween Show! ), and a bright presence on the work-study team. To show our appreciation, Donna will receive a free private lesson with the instructor of her choice! Thank you for everything. FRESH NEW CONTENT, EVERY WEEK! See our schedule on MindBody. For more info, check out our website. Additional info: Email wendy@elevateducation.com for details, discounts, and payment plans. 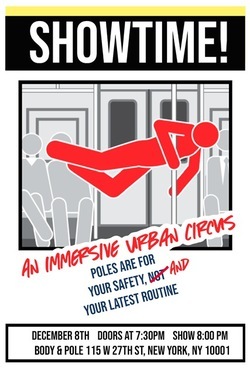 Take a ride with us on an MTA-inspired production at Body & Pole! Featuring acts from elite aerialists, pole dance artists, handbalancers, contortionists, and live musicians; together we will share the deeply human experience of navigating New York City's subway system and the characters that we interact with on our daily journeys. We had an amazing ride for this year's multi-level immersive Halloween show. Take a look at our incredible photos and videos, you may recognize many of your teachers, friends, and fellow students! Jen Kovacs is joining Sweet Retreats DR in January for an aerial retreat in Puerto Escondido, Mexico. Early bird sign up HERE. We are honored to help you learn, create, and transform. Our biggest deals all year long are almost here! 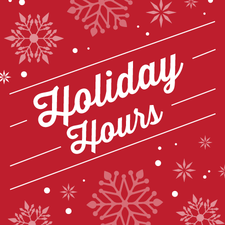 Black Friday deals begin at Midnight 11/23, and Cyber Monday offers begin at Midnight 11/26. schedule on Facebook & Twitter with one click!